My name is Domagoj Pavlešić from Zagreb, Croatia and this is my personal blog. You’ll find posts in both English and Croatian, depending on the subject. Experienced (20y+) developer, software architect and technology specialist. Focused on Microsoft platform (mainly ASP.NET, Azure, Universal Windows Platform) and web standards. Microsoft MVP and ex. Nokia Developer Champion. Trainer. Regular speaker at regional conferences. Owner of dizzy.hr, software development company specialized in web, Azure and Windows development. Contributing editor (18y+) for Bug and Mreža, co-author of the book about .NET Framework (in Croatian). Dev lead of the most popular IT portal in Croatia – Bug Online. 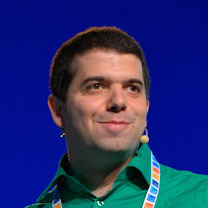 Imagine Cup World Finals Judge (2012), Croatia Finals Judge (2010, 2011, 2012, 2013). I <3 My family. New technologies. Gadgets. Goodies. Code. Follow me on the Twitter. If you prefer e-mail, address is domagoj@gmail.com. I’m also on LinkedIn and About.me.